Who are the mad geniuses behind Hour to Midnight? Hour to Midnight - Room Escape Games are produced by FrightFX LLC. - an entertainment company specializing in set design, custom atmospheres, sound design, lighting design, and themed attractions. They have 20 years of experience in making environments that are hyper realistic and their level of detail and showmanship is unmatched. You may have seen their work at FrightTown (2004-2013), and local plays and film. Back in 2006 FrightFX LLC had a vision of a walk through haunted attraction that was four rooms in length and had a puzzle in each room designed to take about 5 minutes. It was a new concept for haunted houses, and an early predecessor to escape rooms. Due to the nature of how the haunted house industry runs, the timing of a such an event just didn't work out and the idea was scrapped. Fast forward 8 years later, the guys behind Hour to Midnight started investigating the Portland Room Escape market. They had a vision and the start of their first escape room, they just needed to find a building for it. They searched all throughout Portland finding many locations that would work well, but after talking with the City there were always issues with the properties. It wasn't until early 2015 that a place was found, an old Radio Shack building. Here was their chance to create a purpose built interior specific for Room Escape Games. They signed the lease and began the permitting process. 8 long months later permits were obtained, and building commenced. The walls were erected quickly with the help of the contractors and the transfer of their first room began. Since they had already built "The Secrets of Nibiru" in a shop space off site and had already play tested it, the set up went pretty smoothly once they began to build after the construction was complete. 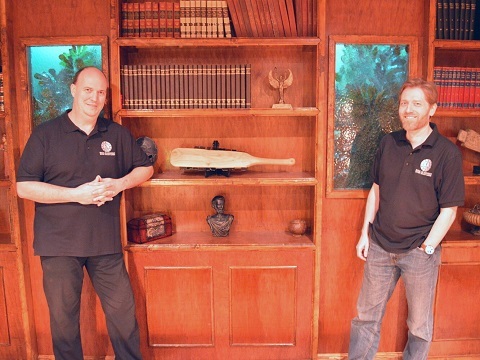 In May of 2015, they opened their first Portland Room Escape Game "The Secrets of Nibiru". As of January 2017 they are finishing the touches of "The Assassins Deadly Game", their second room for Hour To Midnight and the Portland Room Escape Game market. Simultaneously construction on their third game, "The Pharaoh's Curse" has begun; though this game is their most ambitious yet, three rooms with highly detailed sets and props. Still Want to Know More? Send Us a Message! Check your spam folder if you do not receive a reply from us in a day or two. One way to avoid this is to make sure we are white-listed.